That being said, eating better, or at least getting over my desire to shove cookies into my mouth, is definitely on my list. And I already know that one of the best ways to keep myself on track is to eat a healthy breakfast that's both delicious and will keep me full. 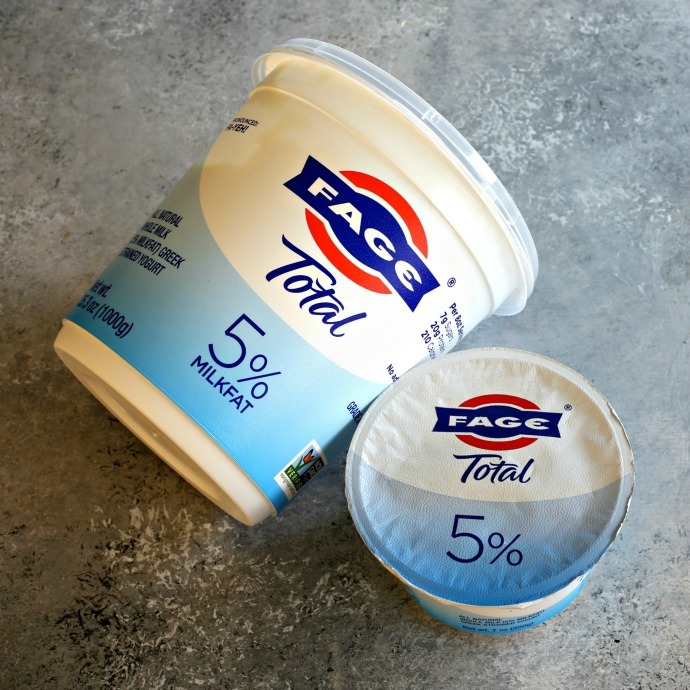 Fortunately, that part of my goal setting is easy because I'm already a serious yogurt lover and the FAGE Total cups are always in my fridge. I have done some rearranging of when I eat them, though. I used to love them as an afternoon snack with fruit but I'm finding that I prefer them for breakfast. The high protein keeps me full for a long time and, of course, it's creamy and delicious. No worries about getting bored either because there are so many topping options. 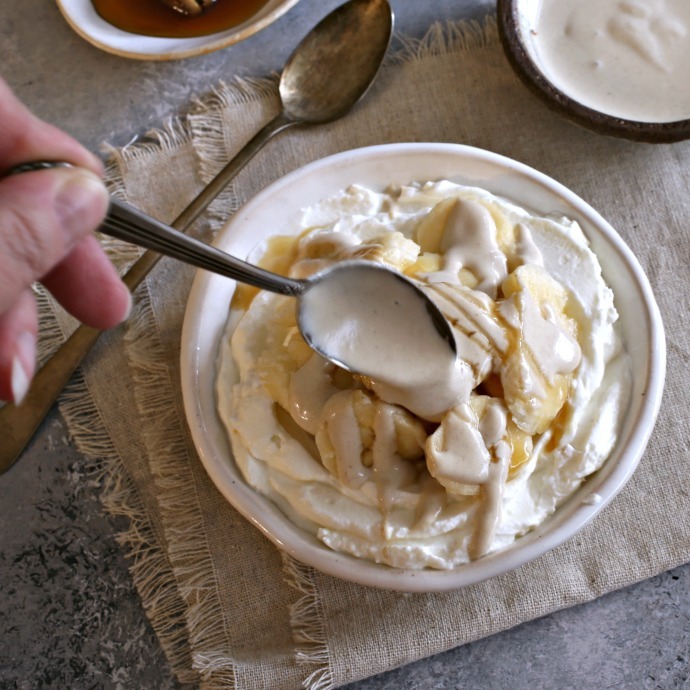 If I'm in a rush, I can just pour some honey over the yogurt or grab a handful of fruit. But doing just a little prep at the start of the week gives me a bigger range of topping options with the same speed. My preference is for the plain 5% because....delicious! But also because it has no added sugar, contains only milk and those all important live active cultures, is high in calcium and it's Non-GMO Project Verified. And, it's the perfect base for so many toppings. 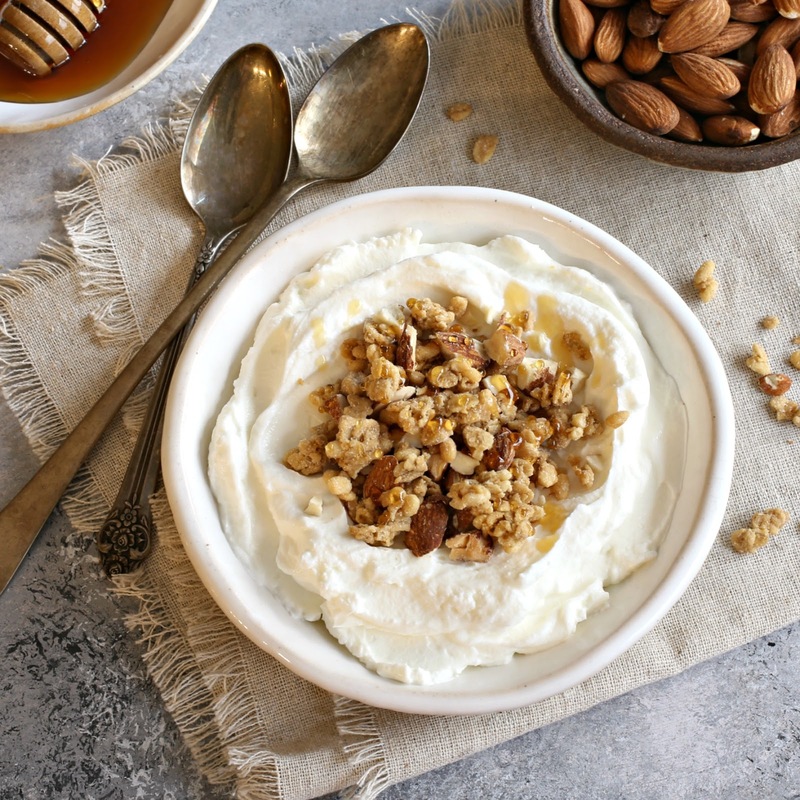 My week of toppings included homemade honey almond granola, spiced nuts, maple blueberry and cardamom compote, za'atar and olive oil (because who says yogurt has to be sweet?) and banana tahini. My fridge is usually stocked with both the individual 7 oz. containers, for grabbing on the go, and the big 35 oz. container for scooping into my morning yogurt bowls. Tell me what your favorite yogurt toppings are. 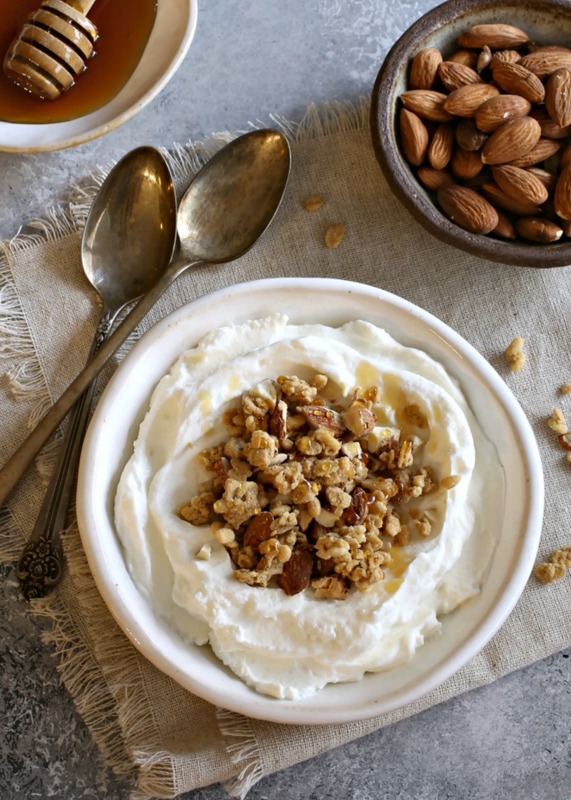 Recipes for a week's worth of creative yogurt breakfast bowls. To make the granola, whisk together the honey, oil, cinnamon and salt in a large bowl. Add the oats and almonds and toss to combine. Spread out on a parchment lined baking sheet and bake in the oven for 15 minutes at 400 degrees. Store leftovers in an air tight container for a week. To make the spiced nuts, combine the almonds, walnuts, pecans and pistachios in a bowl. In a separate bowl, stir together the egg white, honey, cinnamon, ginger, nutmeg and salt. Toss the nuts in with the egg mixture and stir to combine. Spread out on a parchment lined baking sheet and bake in the oven for 10 to 15 minutes at 350 degrees. Be careful not to burn the nuts. 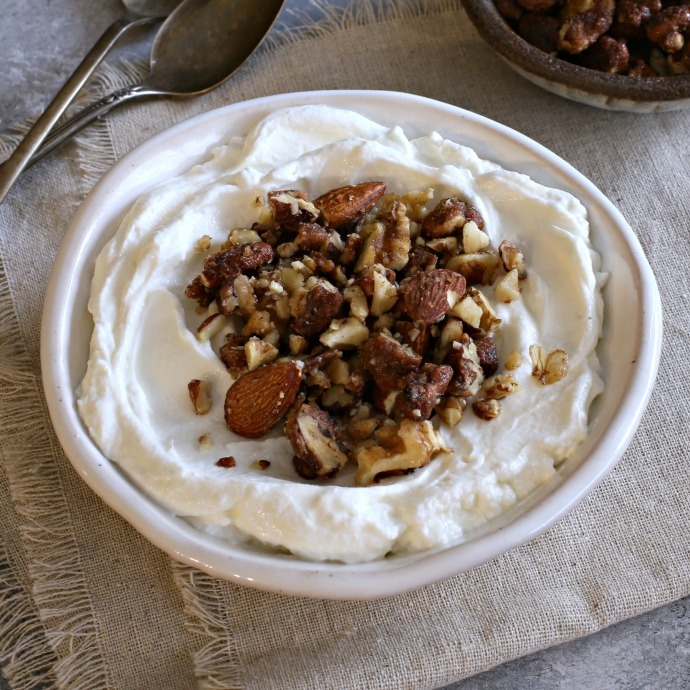 To serve, roughly chop the spiced nuts and sprinkle over yogurt. Store leftovers in an air tight container for a couple of weeks or longer in the refrigerator. To make the blueberry compote add the blueberries to a pot over medium low heat. Stir in the maple syrup, lemon zest, cardamom and salt. Continue cooking, stirring often, until the fruit breaks down and the syrup begins to thicken slightly. Cool and store in a sealed jar in the refrigerator for up to a week. 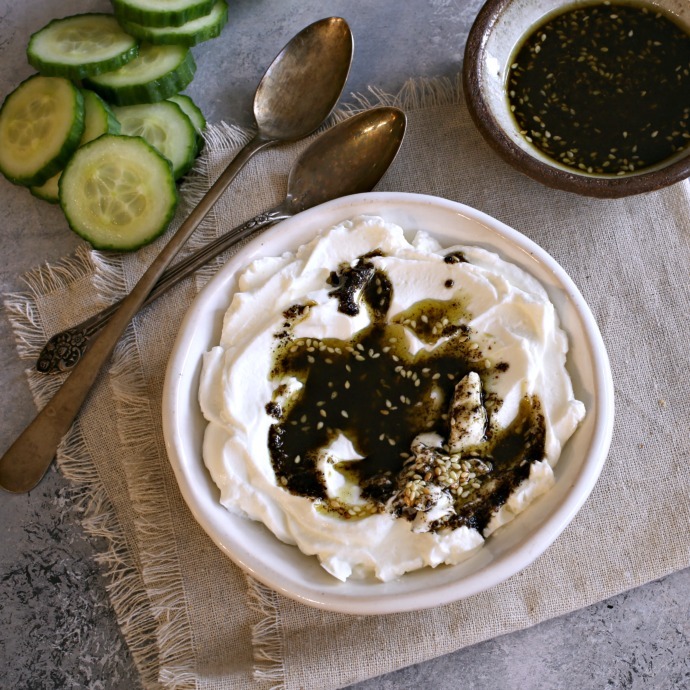 To make the za'atar and olive oil, stir the two together before serving and drizzle over the yogurt. Store leftovers in a sealed jar for a couple of weeks. 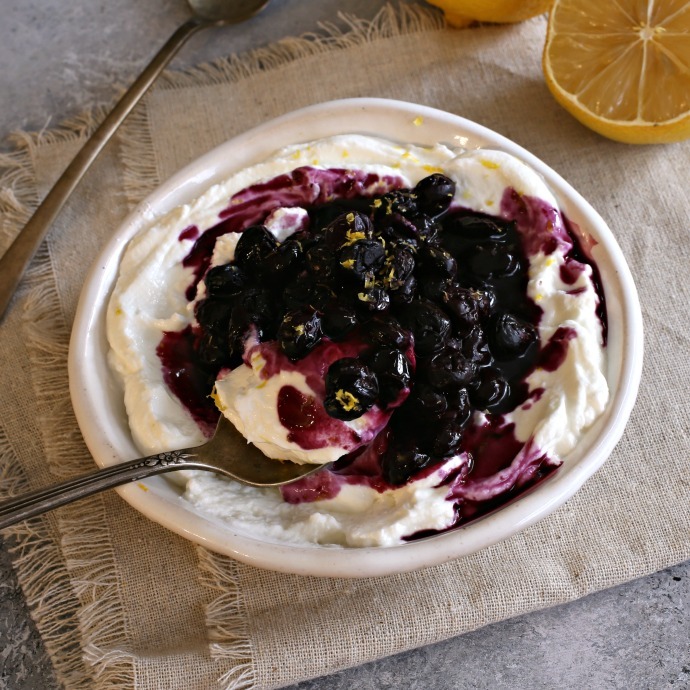 For additional information and recipes using FAGE yogurt, please visit their website.